We are all individuals and, not surprisingly, this is what makes us different. We all like different things for various reasons, and this extends to motorcycles. If it didn’t, there would be just one manufacturer with a monopoly on the maker producing the perfect bike. Thankfully the perfect motorcycle will never exist. We all find different things tickle our fancy, however, there’s two deciding factors almost every purchaser has on his or her motorcycle wish list – enjoyment and looks. Enjoyment is the reason the vast majority of us ride bikes, hell, why else would you put your life on the line each time you roll out of your driveway? And no one wants to ride an ugly motorcycle. Extend the list to three points and performance will also begin to figure prominently. Triumph’s new Thruxton model ticks all of these boxes, and I am yet to find someone who does not feel the same way. Maybe we are all the same? The first time I laid eyes on the 2016 Thruxton was at the AMCN International Island Classic back in January. When the shiny new 1200cc liquid-cooled beauty (fitted with the optional nose fairing) was unloaded, I felt that tinge of heart flutter generally reserved for YouTube videos of Labradors playing with ducklings. Alan Cathcart’s world launch feature in May (AMCN Vol 65 No 22) revealed the performance of the new Thuxton was something special but dealt mainly with numbers, nuts and bolts. 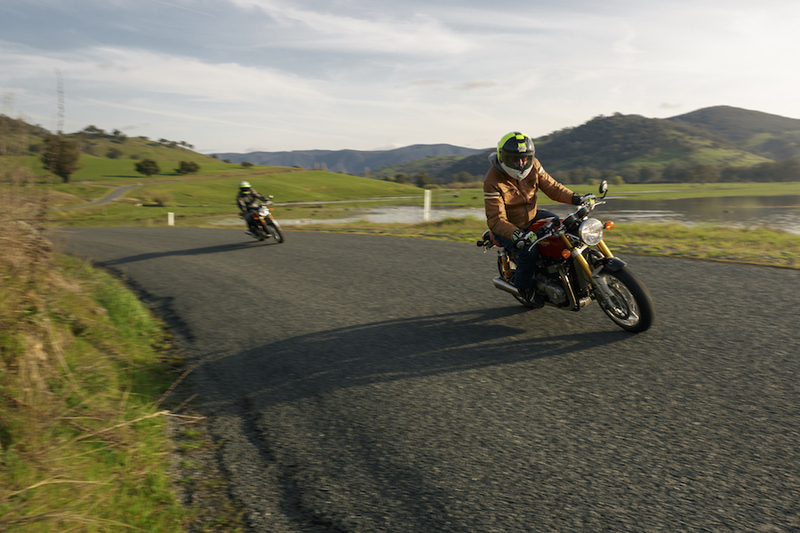 It wasn’t until I threw a leg over the bike at the recent Australian launch that I realised there’s another story to be told here, the story of the pure joy of riding this bike delivers. 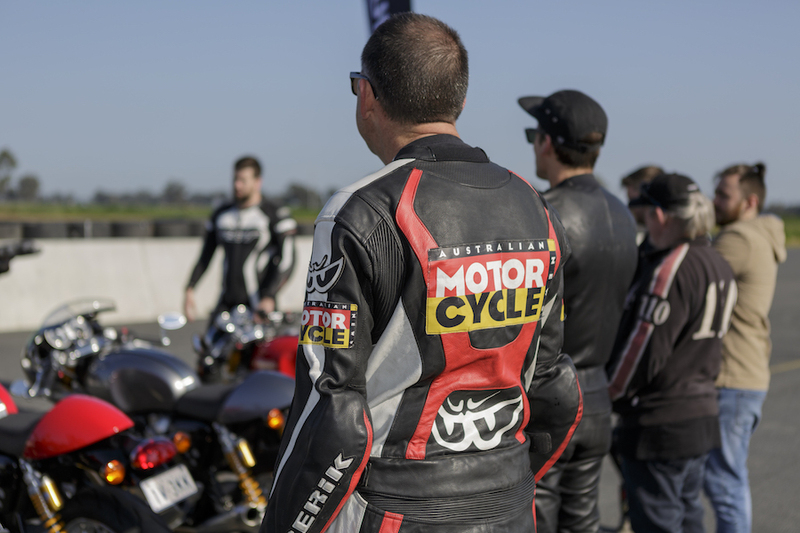 The NSW city of Albury played host to the local launch, its geographical location not only providing a seemingly endless supply of winding roads around Hume Weir, but it’s also close to the Murray Valley Driver Training Centre circuit. 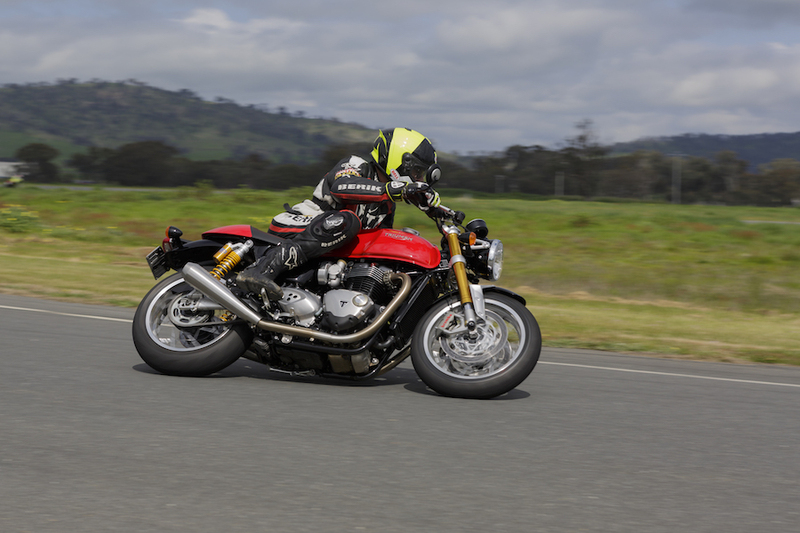 Nigel Harvey and his team from Triumph Australia used both locations to serve up two days of brilliant riding which highlighted just how versatile the Thruxton is. But all of that was yet to happen as I stood amongst the assembled throng of Thruxton R models, sipping a cup of tea and studying the details of the new Thruxton R prior to day one. I couldn’t help but admire the effort Triumph has put into the bike as I noted the differences which make the Thruxton a stand-alone model, not simply a Bonneville T120 Bonneville with a single seat. The Thruxton-unique aluminium swingarm is shorter than the Bonnie unit, reducing wheelbase from 1445mm to 1415mm. When combined with a reduction in front wheel diameter from 18 to 17-inches it dramatically alters the bike’s chassis geometry, sharpening the steering rake from 25.5 degrees to 22.8 degrees (22.7 on the standard Thruxton), and shortening the trail from 105.2mm to 92mm (90.8mm Thruxton). 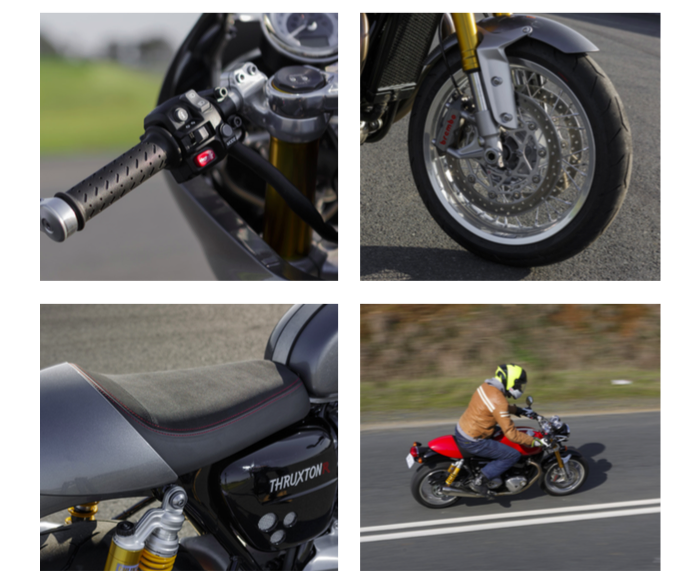 The reason for the disparity between the Thruxton and Thruxton R numbers comes from the R model being fitted with a fully-adjustable 41mm USD Showa big piston fork and twin Ohlins piggyback reservoir shocks, replacing the in-house kit on the standard Thruxton. The R also gets twin four-piston Brembo monobloc calipers to clamp the 310mm discs up front, replacing the two-piston Nissin units. Is the extra bling worth jumping from $18,100 (+ORC) for the standard Thruxton to $21,100 (+ORC) for the R version? It appears 80 per cent of Aussie buyers thinks so. Don’t get me wrong, the base mode is a great bike, and it’s proving difficult to get your hands on a Thruxton at all, but for an additional $2400 you get so much more. The extras list includes a brushed aluminium tank strap, polished top yoke, colour-coded seat cowl and billet bar-end mirrors. In the time it had taken me slurp down my Liptons, I had already deduced that the Thruxton R is a horn looking bike, and I still had two days of riding ahead of me. By nature, Café Racers are meant to be compact bikes, and while the 2016 Thruxton is physically bigger than the model it replaces, it’s still a small bike, and I am still a large man. Fear not, fellow giants, the cockpit of the Thruxton is far from cramped, and room to move is assisted by tank cut outs which are not only perfectly matched to the bike’s styling lines, they are also in the right place and large enough for proper-sized legs. The clip-on bars are also a stylish touch, and thanks to a clever design which sits the bar higher than the clamp top yoke, yet retains the clip-on look and you are not forced into too much of a racy position by the slightly rear-set pegs. Thanks to the snug single seat, with the obligatory Café Race hump, ergonomics are well within the comfortable range expected from a bike of this style. It’s also easy to imagine a set of aftermarket rear-set pegs and lower clip-on bars not making things too uncomfortable while adding a real garage-built cafe racer feel. It’s the little things that make a big difference, and our first stop proved this. Fuelling up the bikes saw the conversation quickly turn to the Monza fuel cap. The stylish, chrome flip-up unit hides a second lockable cap, and the thought put into designing it is an indication of the effort put into the entire bike. The cap led to discussions about the replica Amal carburetors which cover the throttle bodies, as well as a ‘points’ cover added just for that extra touch. When was the last time you read about fuel caps and points covers in an AMCN test review? If I were a skeptical man, I would suggest the ever-thinking Nigel Harvey threw in the early fuel stop for this very reason. 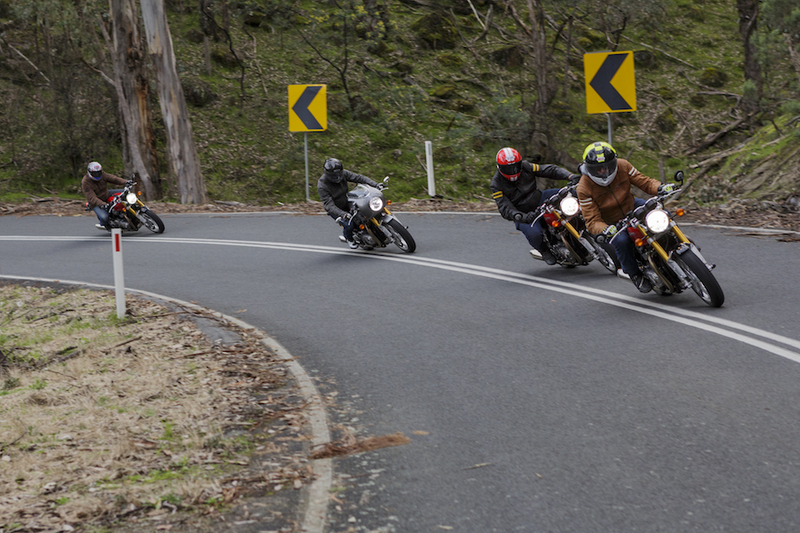 Part one of the road ride was to familiarise ourselves with the bike, and have a fiddle with the Rain, Road and Sport throttle maps offered by the ride-by-wire system. While the Thruxton is Triumph’s most powerful Bonneville, there’s no need to rein in the ponies across the three maps. Changes to the throttle twist V’s butterfly opening ratio does the job of measuring out the required power delivery in each of the three modes, while a single-level traction control looks after the rest. The TC can be disengaged allowing the 112Nm to be used for all sorts of cool stuff including easy wheelies. 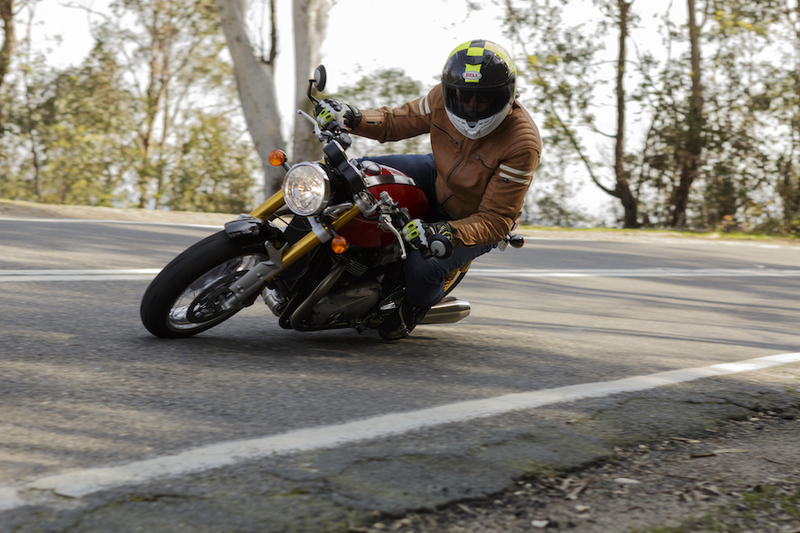 The Thruxton does not have wheelie control, but the traction control will cut in when the front wheel is in the air due to the disparity in rotation speeds between the front and rear wheels. The ABS is also switchable, and all these functions are easy to access via a series of buttons and switches on the switch blocks. Both the ABS and TC can only be disengaged when the bike is stationary, so if you are planning on doing a wheelie, keep this in mind. Both systems also default to on when the ignition is turned off – sometimes annoying, but safety first. All of the relevant information required for 21st century motorcycling is displayed on two LCD screens and a host of warning lights built into two retro-style analog clocks. An early stop for lunch to cross reference a few thoughts with others riders left the afternoon free to let loose and have a bit of fun, and it’s in the area of rider fun where the Thruxton will prove itself to be a sales winner for Triumph. When the early spy photos of the 2016 Bonneville range first emerged last year, the twin-disc front brakes and radiator helped fuel the dream of a 1000cc Bonnie. We received more than we had hoped for when the 1200cc T120 was launched earlier this year. With 59kW, 105Nm and six gears, Triumph christened it the High Torque engine. It was such a big step up from the five-speed, air-cooled 865cc twin it replaced, we didn’t ask for more, however, the Thruxton has delivered more. Called the High Power engine, the Thruxton mill has been warmed over with a lighter crank, high-compression heads, redesigned airbox and model-specific exhaust. The result is an increase of 13kW to 72KW, peaking at 6750rpm, and an additional 7Nm to 112Nm, which peaks an impressive 1850rpm higher in the rev range than the Bonnie T120 (4950rpm v 3100rpm). 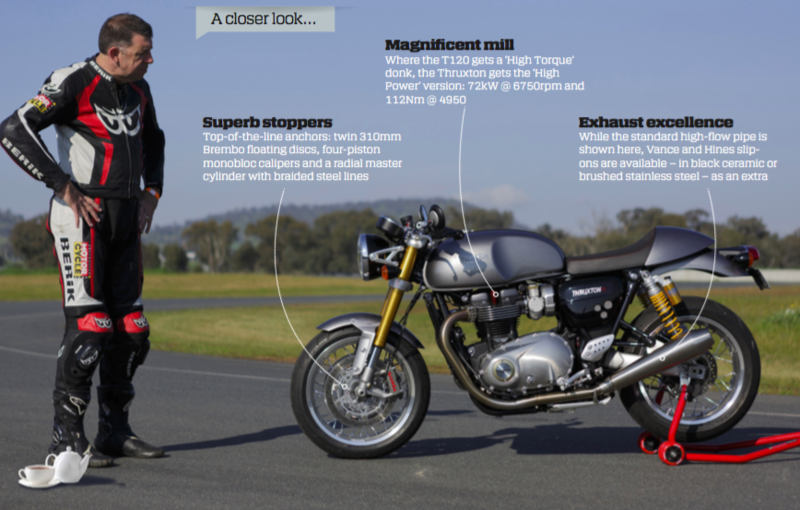 These numbers are the secret behind the Thruxton’s sporty heart. Providing a faster-revving engine with maximum outputs higher up the revs furnishes the big parallel twin with the sport edge required to set it apart from its T120 sibling. Sure, 72kW sounds small compared to the 150kW-plus being pumped out by today’s road-registered sportsbike rocket ships, but on our afternoon blast, I reckon I used every last one of them, and had a huge smile on my face while doing it. With the not-too-intrusive traction control keeping an eye on things, the Thruxton uses its dollops of torque to great effect from 2500rpm all they way through to 6000rpm – the bike just pulls effortlessly. There’s no sudden burst of power to catch you off-guard, just an even-tempered delivery that does not leave you asking for more. 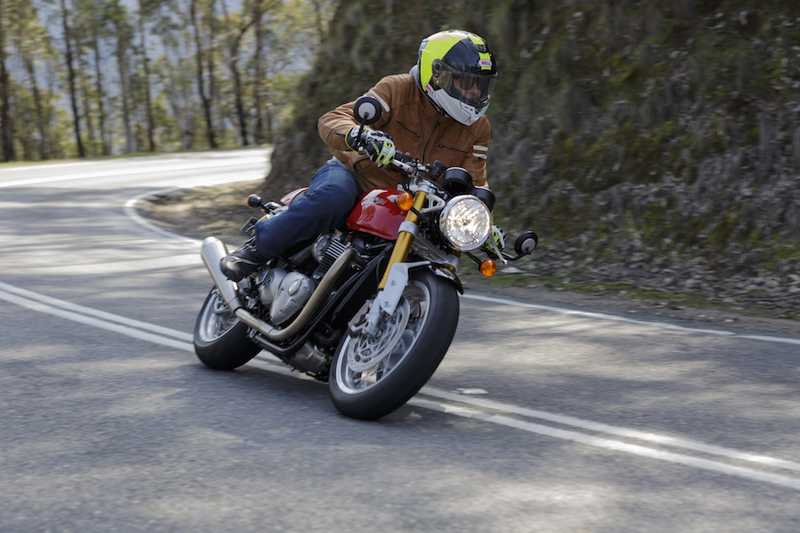 Day two of the Aussie launch was held at the Murray Valley Driving Training Centre, and despite my growing affection for the Thruxton, I did hold a few reservations as to how it would handle track work. I went into the day picturing destroyed foot pegs and grazed mufflers, What I discovered was the Thruxton has the knee-down credentials to credibly link it to the race which gave birth to the Thruxton model. More than a few toe-scrapers, footpegs and knee sliders were damaged during our time on the flowing little circuit, but that’s in indication of just how confidence inspiring the bike’s handling is. It’s nothing a rear-set kit wouldn’t fix if you were thinking of taking your Thruxton to the track on a regular bassis. While I was happy to have the traction control in the background during the road ride, for the track I opted to disengage it. The set-up of the bike, its smooth power delivery, and sticky Pirelli Diablo Rosso Corso tyres were more than up to the task of keeping me upright. I tried a combination of ABS on and off, and the only time I felt a difference was under heavy breaking at the end of the main straight where the rear ABS would kick in a little earlier than anticipated. As expected, the Brembo calipers had no trouble pulling up the bike’s claimed 203kg (dry/claimed) weight into each of the circuits tight turns. A café racer breaking the 200kg mark may sound a little portly, but Triumph has distributed the weight well, and thanks to the effective stoppers, extra grunt and 745mm wide handlebars, the whole thing feels lighter than the numbers indicate. 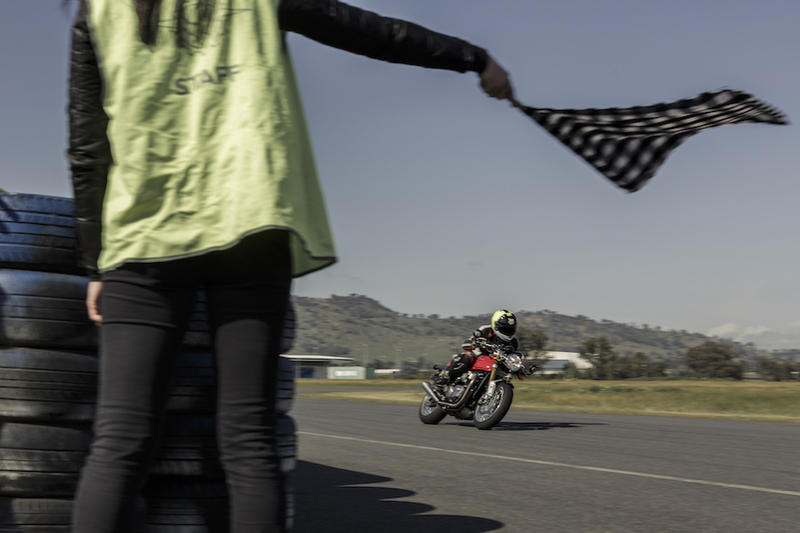 The only effect a few hours of bashing around the circuit had on the bike was to amplify the fun factor it can deliver. A sweet handling chassis, quality suspension, and sticky Pirelli tyres are a great match for what the 1200cc engine delivers. I even managed to get my hands on a bike with the full Track Racer kit fitted, and if you think that nose fairing looks awesome standing next to the bike, wait until you are aboard it. Returning clip on bars to Thruxton has been a stroke of genius by Triumph, and when the optional lower clip-ons are fitted with the bikini fairing you would swear you have just been transported back 50 years (taking the handling and power with you.). The Vance and Hines slip-on mufflers sound brilliant, however, it does feel like they rob the bike of a little grunt down low. It would be interesting to get the bike of the dyno with both systems fitted to see it what is actually happening. Triumph’s new Thruxton R is a reminder of a time when Brit-made parallel-twin powered bikes ruled the world, and it had been combined with performance and quality demanded by 21st century buyers. But as I said at the beginning, no one will ever invent the perfect motorcycle and the Thruxton does have its shortfalls. With just a couple of days to evaluate the bike, these shortfalls remained limited to an annoying side stand which I found easier to engage with my hand than my foot, and the cheap-looking tail-light which is at odds with the bike’s lovely lines. Having said that, if I was purchasing a motorcycle for $21K and those were the major items I had on my negatives list, I’d be reaching for my credit card PDQ.